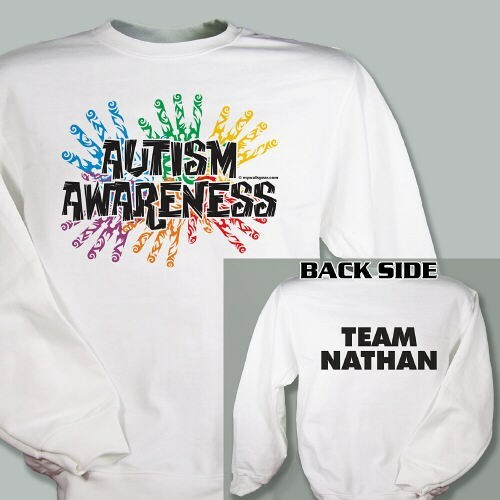 Gather your team and start walking at your next Autism Awareness Walk Event and show your support with this Personalized Autism Walk Team Sweatshirt. Your whole team is sure to look great walking proudly for the ones you support. Your Personalized Autism Team Sweatshirt is available on our premium cotton/poly blend Sweatshirt, machine washable in adult sizes S-3XL. Our Personalized Autism Shirts are also available in Ash Gray and Pink. Each Shirt includes Free Personalization. Personalize your Autism Awareness Shirts with any three line custom message on the back. Additional Info April is Autism Awareness Month. Help make life easier for yourself and families who have children with Autism by showing your support with Personalized Autism Awareness Items from MyWalkGear.com. Our growing collection of Autism Awareness Items will help educate everyone about the diversity of people and families living with this condition. Being a part of an Autism Awareness Walk Event is just one step closer to raising awareness. This Personalized Sweatshirt is perfect for your next walk event and looks great along with our Personalized Walking for Autism Hat and our Personalized Autism Walk Team Water Bottle.